Slowly, we've been spraypainting all the brass door knobs and hinges in the house a matte black (Krylon Satin Black). I like how it gives the white doors a little bit of pop. Its an old designer's trick, adding a bit of black in every room to ground a space and finish it off. Do you have bits of black in your home? Not yet, but I will. I'm LOVING the bath decal though. And the doorknobs... which is a significantly cheaper way to achieve that look than to replace everything will oil-rubbed bronze! Do you notice that the paint chips off or is it pretty durable? It looks great! Just wondered how it stands up to everyday life and wear & tear. 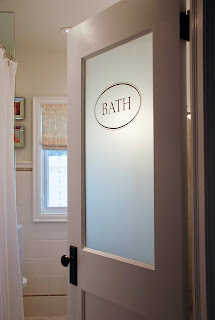 Please do tell where you got the fab bath sign for the door. I've been on the hunt for similar. Only in closet with the black. In my decor I tend to lean towards, browns, greys for some reason, but I love the look you have for your home. I love bits of black and do incorporate it into almost every room. Your house looks so fabulous...I love the bright white trim...oh how I wish I had that!! We tried a few test cases to see how the paint holds up. I find that it does chip off the latch as it hits the strike plate, but thats metal on metal so what can you do. I am using Krylon red primer and Krylon satin black paint with a couple of coats for each. I have also used a mechanical rotary wire brush to strip off all the old paint and then roughed up the brass knobs with some 100 grit sandpaper so the primer will stick. So far its holding up well on the knobs. I also tried different laquers but for some reason I could never get a consistent texture so I just went with the paint. I also tried Tremclad but I wasn't as pleased. The best would be auto body laquer but you can't find it in Satin. Emily - so far, so good. 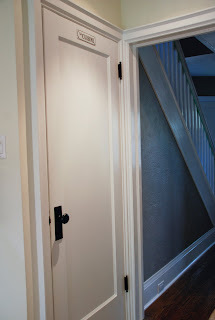 We used red spray primer and then two coats of the satin black. I do notice some wear in places where the parts rub together (e.g. on the bolt) but its still cheaper and easier to re-paint than it would be to get all new vintage locksets. JEM - I had the Bath decal custom made by etsy.com seller Elephannie. 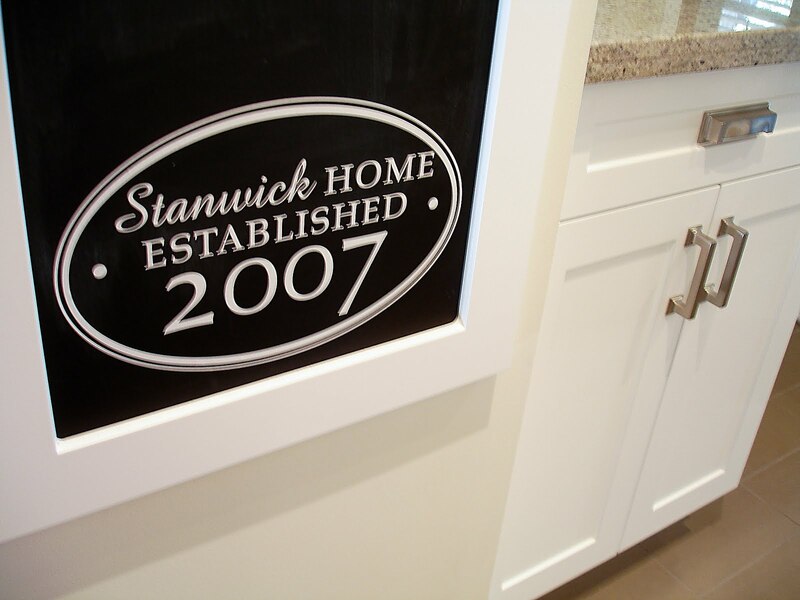 She also did the "Home established" decal on the chalkboard, which you can find in her shop. Looks fantastic!! I love hits of black and white. 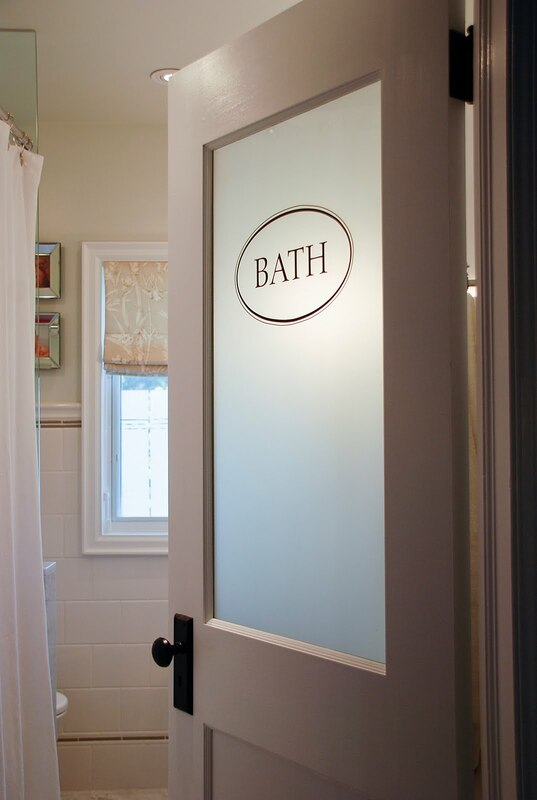 Thanks for the reply about the bath decal! And, my apologies for being so rude to not tell you just how great everything looks (I got far too excited when I saw the bath decal!). You might have just solved a big dilemma. I have been wanting to change out to my front doorknob. But that involves re-keying, etc. Do you think I could just paint it? Do you think the Krylon would hold up pretty well? It might be worth trying. Oh, and yes, I have touches of black in each room. Love it! It looks great...wonderful idea to just use spray paint! It does look great! Our house is about 15 years old-built in the brass period. Ha! I may try to tackle this during the summer. I do have touches of black in about every room. I painted the spindles on the stair case black and love them! These are amazing tips...you are doing a great job...neat and great look.Will get the black. Plenty of black accents in this old house. Love my black banister. Your house looks great! Love your touches of black. 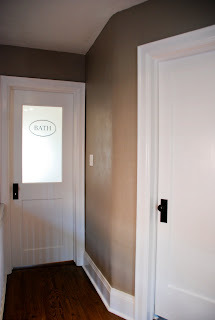 I'm impressed with how great the black doorknobs look. I'd love to hear back in a year about how they hold up. Your doorknobs look great in black. We have hits, or a bit more, of black in all our rooms too. I love black frames. I became a follower and added your blog to my sidebar so I can see all your new posts. I really love black. I have some black furniture and my kitchen has black cabinets. 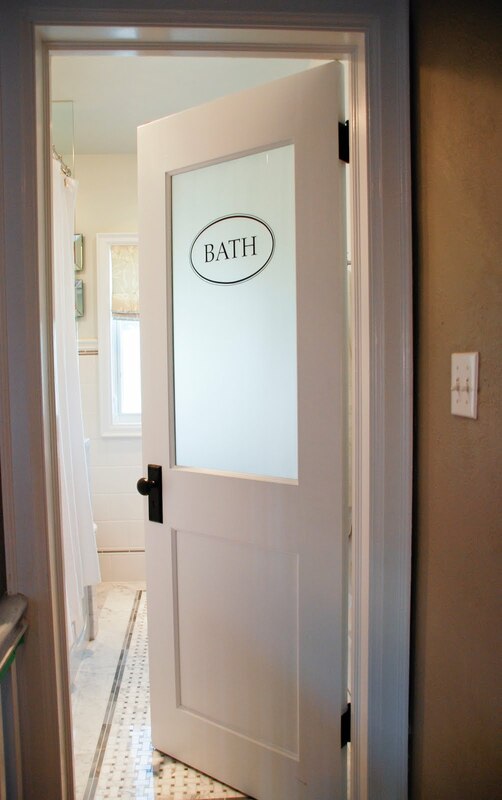 Your bathroom door is to die for. I love it! How is the spray paint holding up on the doorknobs? 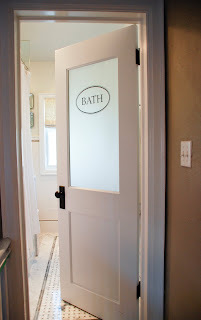 I'd love to paint all of our brass knobs and hinges more of a brushed nickel color, but I'm worried about the finish rubbing off from excess use. Obviously a repaint job would still be cheaper than buying all new door hardware, but I hate to go to the effort to paint and then have to repaint later. Thanks for the link, Handyman! That looks like it might be a more durable, albeit more expensive, alternative to Rust-o-leum's silver metallic matte finish spray paint. 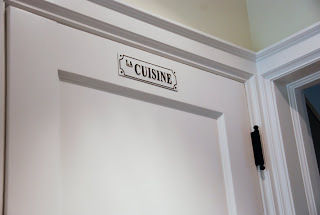 We've used it on light fixtures and photo frames, but never on door or cabinet hardware.